A great vintage, this year is characterised by the contrast between an extremely hot July and a very cool August. September experienced heat and two heavy rain pours during the first half of the month. This did not hurt the quality of the vintage and we were able to harvest late with the beautiful Indian summer lasting until mid October. Each variety is harvested manually and separately. Vinification is completed in truncated oak barrels for the reductive grapes (Mourvèdre and Syrah) and in traditional tiled cement tanks for the oxidative grapes (such as Grenache). After the malolactic fermentations, the family blends the different varieties and then the wine ages in oak Foudres for a year before bottling. Colour: dark and deep ruby with purple undertones. Nose: very rich with ripe black fruit, cherry, fig and slightly smoky. Mouth: round and powerful, great balance between the tannins and the body, with notes of red fruit. The nose reveals fruity characters, marked by a very aromatic structure which is incredibly present. The gourmet character of this wine gives it great potential and its youth allows it to be enjoyed right now.. Decant 2 hours before serving. The 2006 vintage is airy; nice colour, animal notes on the nose, and a balanced mouth between acidity and softness. Mid to pale crimson. Sweet and flirtatious. Transparent. Doesn’t taste 14.5% at all! There is fesh acidity here and a certain meat-and-two-veg quality. You could enjoy it already although I’d be inclined to wait for more aromatic complexity to develop. Medium to deep garnet colour. Pretty perfume of freshly crushed raspberries / blackberries with nuances of wet leaves, cinnamon and white pepper. The medium to full bodied palate provides a good concentration of juicy berry fruit countered by medium to high acidity and a medium level of velvety tannins. Wonderfully balanced. Long finish with notes of white pepper. 13.4% alcohol. Drink 2010 - 2030. Tasted August 2009. This wine’s dense plum/ruby/purple color is followed by a big, sweet perfume of black truffles, camphor, earth, incense, new saddle leather, and loads of peppery, blackberry, and herb-infused, meaty, black cherry fruit. 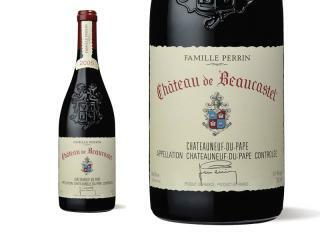 Deep, full-bodied, and dense, with sweet tannin, this explosively rich Chateauneuf is a stronger effort than the 2005, 2004, or 2003. A fantastic wine, the 2006 Château de Beaucastel Châteauneuf-du- Pape fleshes out with air and displays deep, earthy aromatics of dark fruit, roasted meat, graphite, mushroom and old wood. In the mouth, the wine displays a medium to full bodied, structured personality to go with a fantastic texture, concentrated fruit and a long finish. If drinking anytime soon this needs plenty of air. Powerful, with a round, almost creamy core of blackberry and raspberry fruit all layered with cocoa, sweet toast, mesquite and fig paste. Long and rich through the finish. Still quite primal, with lots in reserve. Best from 2010 through 2030. Powerful, with a round, almost creamy core of blackberry and raspberry fruit all layered with cocoa, sweet toast, mesquite and fig paste. Long and rich through the finish. Still quite primal, with lots in reserve. Vivid ruby. Spicy, finely etched red berry and cherry aromas are complicated by fresh lavender, herbs and minerals. The palate offers tangy raspberry and cherry skin flavors, with gentle tannins adding shape. Impressively pure, even delicate, with outstanding finishing clarity and length. This beguiles rather than brutalizes; I underestimated it last year.